Pierpaolo Petruzziello now temporarily has something that Luke Skywalker had in Star Wars - a thought-controlled robotic hand. During a one-month experiment, he learned to control the hand with his mind — and said it felt like his lost limb had grown back. He said: "It's a matter of mind, of concentration. When you think of it as your hand and forearm, it all becomes easier." Petruzziello learned to wiggle the robotic fingers independently, clench a fist, grab objects and make other movements. 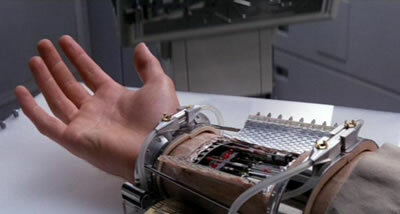 Consider the robotic hand that Luke Skywalker gets in Star Wars after an argument with his father. Here's a question for Mr. Petruzziello and his roboticists and physicians: why make do with a regular-sized hand when you can have a GIANT robotic hand?